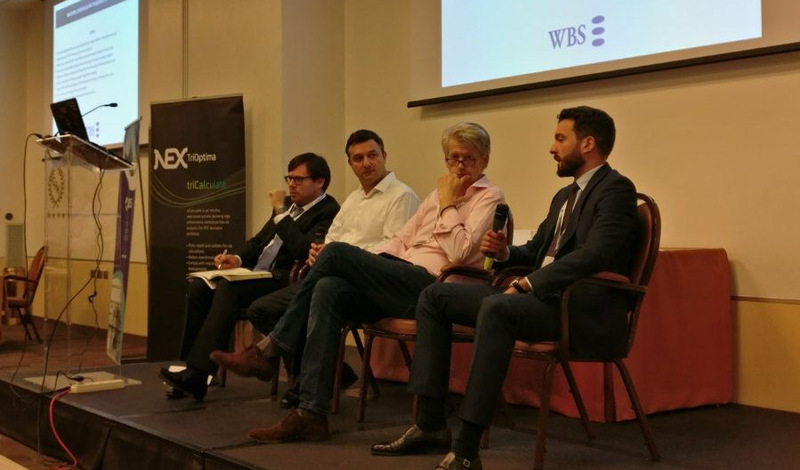 The annual WBS Fixed Income Conference was held in Florence on 18-20th October. Held for the first time in 2005, the Fixed Income Conference has become a major event in the quantitative community and it attracts between 150-200 delegates from top financial institutions each year. This year, a number of leading experts like Jesper Andersen from Danske Bank, Michael Pykhtin from the Federal Reserve Board, and O. Ediz Ozkaya from Goldman Sachs, were invited to share stories about the latest developments in quantitative analytics, the regulatory environment, and emerging technologies. Ioannis Anagnostou from UvA’s Computational Science Lab and ING’s Quantitative Analytics team led by Prof. Drona Kandhai delivered an invited talk on the applications of Complex Networks and Machine Learning in trading and risk management. Ioannis also shared a discussion panel on Machine Learning and High Performance Computing in Quantitative Finance with Paul Bilokon from Deutsche Bank, O. Ediz Ozkaya from Goldman Sachs, and William McGhee from Natwest Markets, where the topics covered included the current utilization of Machine Learning, the future of quantitative analytics, and the main pitfalls of using data driven techniques.